Step up and get down with Breezer Vivid Shuffle - Hip Hop Club Shows on Saturday, September 15, 2018. 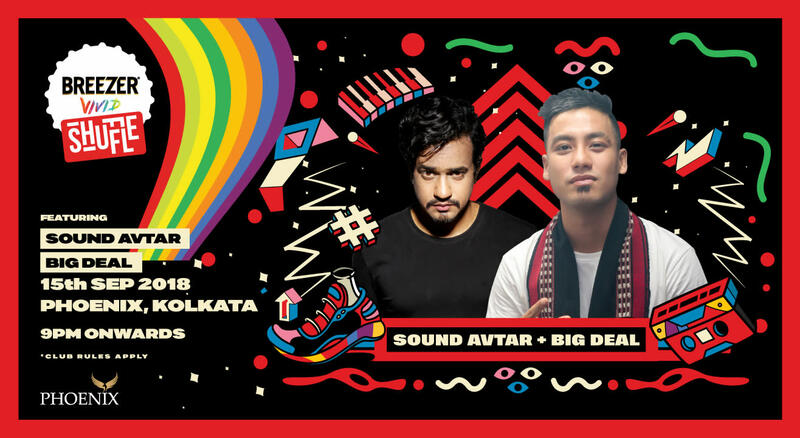 Groove to the best hip-hop sounds and rap with - SOUND AVTAR + BIG DEAL who will be behind the deck at PHOENIX, Kolkata. Calling all the HIP HOP Heads. Come together to party with the best from the scene and #livelifeincolour. Rhythm and rhymes will flood your nights..
Big Deal happened when a bullied teenager watched 8 mile and listened to Eminem for the first time. Rap gave him a voice, rap got him attention, rap let him vent. However what started as a hobby 10 years ago, has transitioned into a full blown career. Big Deal is a well known rap name in the Indian Hip Hop scene. He has several accolades to his name, such as: Radio City Freedom Best Hip hop artist 2016, Sennheiser top 25 artist in India, Renault Free the music contest winner. He has collaborated with big names such as Sneha Khanwalkar, Shraddha Sharma, Blaaze, Adnan Sami as well as worked on the Bollywood movie "Detective Byomkesh Bakshy". He has done India tours, been on channels like VH1, MTV, 9XO, been on magazines like Rolling stone, Rock street Journal and almost every South Indian newspaper. Big Deal is also a music producer and he produces all the beats he raps on. In addition to that, he produces beats for other rappers and singers. He has created songs for big brands like Colgate, Nissan Datsun Redigo, Tixdo, Red FM. Voted Best Drum & Bass/Dubstep Dj/Producer by MYFAV Awards for the year 2012-13 & 2013-14, Piyush Bhatnagar aka Sound Avtar is an explosive force from the country’s burgeoning Dance music scene. Hailing from Jaipur and based in Mumbai at the moment, Sound Avtar uses cutting edge music production techniques, creativity and innovation and concocts tunes so monstrous that it’s hard not to take note of this young producer’s earth rattling productions and Live sets. Shared stage with artists like Skrillex, Knife Party, Skream & Benga, Major Lazer, Martin Garrix, Delta Heavy (UK), NGTHMRE, Jackal to name a few. His tracks “Scattered Light Tunnel” & “Cursed” have charted as high as Top 30 on the Beatport Glitch Hop & Dubstep Charts as well as have been featured under “Beatport Must Hear Dubstep tracks” indicates that his blend of diverse drum patterns, heavy bass drops and non- conventional melodies is here to reach out and map the globe with his music. Starting off with High Chai Recordings Sound Avtar’s productions have graced many labels around the world like Black Hole Recording’s sub label Rub-a-duck, Hood Famous Music, Monkey Dub Recordings, Straightup Music, Magik Muzik to name a few. A regular performer around the Indian club circuit, Sound Avtar has been playing all around the country at various clubs in addition is to his infamous appearances at the Bass heavy stages of India’s 2 most eclectic festivals NH7 Weekender & Sunburn. Sound Avtar’s talent has further been recognized by brands like Beatport to feature his track “1 Up” & “Monster on a Rope” on there “MASHBOX App”. Closer home, Sound Avtar was recently commissioned to remix one of the tracks from the OST of a Bollywood Movie - Gangs of Wasseypur 2 which further cements the versatility and popularity of this young Indian producer who is a force to be reckoned with in the future.